Samsung Electronics has reportedly decided to stop using batteries produced by its affiliate Samsung SDI in its new smartphone Galaxy Note 7 after defects found in some of the batteries led to a sweeping recall of over 2 million phablets worldwide. “As a follow-up of the battery issue, we decided to temporally stop using Samsung SDI’s battery for Galaxy Note 7,” several local media outlets reported on Monday, citing sources from Samsung Electronics. Samsung SDI supplies 70 percent of batteries used in the cellphone giant‘s latest phablets with the rest produced by Chinese battery maker ATL. With the decision, Samsung will likely increase the supply from ATL. Samsung SDI began the development of non-removable batteries since the end of 2014 but failed to supply many of them to Galaxy S6 last year because of other rivals such as LG Chem and ATL. 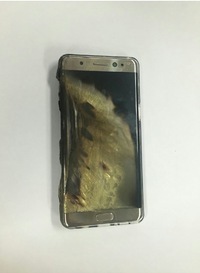 Although the company has been successful in supplying a large number of its non-removable batteries to Samsung Electronics this time, it has been dealt a major blow after a series of reports on fires. Industry watchers said Samsung SDI would have a tough second half if the global recall begins. “For the global recall of 2.5 million units, Samsung SDI is expected to bear the expense for most of the battery parts,” said Lee Seung-hyuck, an analyst from Korea Investment & Securities. “Together with the possible sales decline of Galaxy Note 7, Samsung SDI’s operating loss may stand at around 18 billion won ($16 million) in the third quarter,“ Lee added. Following the news reports, Samsung SDI’s stock price has dropped 2.76 percent to 105,500 won from the previous trading day. Samsung Electronics, for its part, is predicted to spend up to 1.5 trillion won for recalling 2.5 million units, according to German banking company Deutsche Bank.